Graduates will be trained to “speak the language” of both data science and one of eight domain specializations. WSU-educated data analysts will be prepared for employment in manufacturing, e-commerce, transportation, retail, healthcare, government, insurance, finance, education and environmental management. The degree (https://data-analytics.wsu.edu/) is available on the Pullman and Everett campuses and will be expanded to the online Global Campus in the fall. With the continual increase in data generation and capture, businesses across the Pacific Northwest and beyond have a growing need for skilled professionals who can apply sophisticated data science techniques to address specific industry needs. According to the U.S. Department of Labor, data-related employment opportunities are expected to rise dramatically over the next decade. Additionally, the 2016 Harvey Nash/KPMG CIO Survey found data analytics was the highest priority for two years in a row and almost 40 percent of information technology leaders are unable to meet their data workforce needs. “We are excited about expanding opportunities for students and equipping WSU graduates to meet employer workforce needs both now and in the future,” said David Brown, director of the data analytics program and associate professor of crop and soil sciences. The curriculum of the WSU degree includes hands-on experience managing and analyzing real industry datasets to solve problems, guide decision-making and make predictions. For example, students might comb through diverse public datasets to improve insurance models, assess real-time customer behavior to optimize supply chain management or design data-driven maintenance schedules that reduce equipment downtime. Partnerships with industry leaders will provide critical insights into the rapid evolution of big data in the workplace. 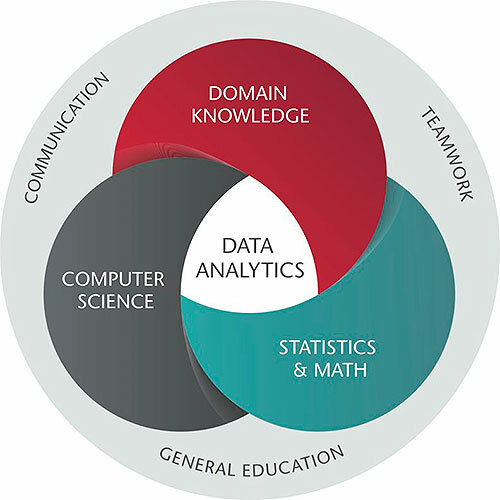 A truly interdisciplinary effort, the data analytics program supports WSU’s mission to extend knowledge through innovative educational programs. Academic responsibility for students is shared by the College of Arts and Sciences and the Voiland College of Engineering and Architecture. The university also received critical legislative financial support to expand the degree to the WSU North Puget Sound at Everett campus. “We are immensely grateful to the state legislature for investing in WSU and helping us offer this valuable degree to more students for the 2016-17 academic year,” said Schulz. Actuarial and business tracks are offered at WSU North Puget Sound at Everett (https://everett.wsu.edu/majorsdegrees/data_analytics/) and will be expanded to the Global Campus in the fall.